The solemn collects of Good Friday include prayers for “those who in the name of Christ have persecuted others” that “God will open their hearts to the truth, and lead them to faith and obedience.” We like to tell ourselves that Christians killing in Christ’s name is a relic of the Middle Ages. Sadly, this continues right up to today, to the tune of $660 million in US military contracts. Well, this priest in Christ’s Holy, Catholic, and Apostolic Church is outraged. Where to begin? Let’s start with practical matters. It will (rightly) inflame Muslims to learn that US military forces are fighting a war with equipment that contains references to the Bible, such as one to John 8:12 (“Whoever follows me will never walk in darkness, but will have the light of life”). How can we have any credibility when we say we are not fighting a new crusade, while our forces use equipment that is marked with verses about following Jesus? Continuing to speak as a priest, I am further outraged by the perversion of the faith to which I devote my life. Jesus surely wants us to share the Good News with the whole world, but not in the side of deadly weapons. More to the point, killing in Christ’s name violates every teaching of the Gospels. I might concede that war is a necessary evil, though I have strong pacifist leanings, but we can never imagine that we have God’s approval to fight wars. Every war, every weapon, and every death in battle represents a tragic sin. 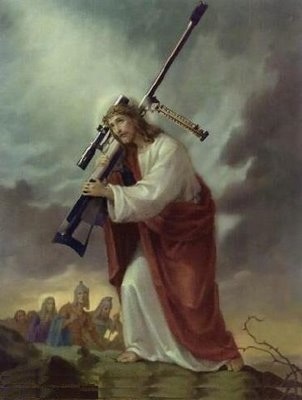 To mock Jesus Christ by stamping “the light of Christ” on a rifle scope is to engage in deadly blasphemy. Now I’ll switch to my American citizen hat. I do not want our government to purchase and employ weapons with religious messages of any kind, from any religion. I do not want our government to make choices, especially involving Christian references, that will needlessly provoke the wrath of the world. To continue in this reckless behavior is to breed a new generation of terrorists and others who hate the “crusading Americans”. We must have accountability here, for two reasons. First, we need the world and especially those who are likely to misunderstand the US, to know that we are not a nation of crusaders bent on exterminating Muslims. Second, we must not have suppliers to our government, especially our military, foisting their religious views on others. Congress must hold hearings right away to find out if this is an isolated case, or if this is a widespread practice. Here are three ideas for responding to all this. Procurement officials must be fired. Whoever knowingly approved this purchase (starting at the top of the food chain) must lose their jobs. This is not a time to sack a low-level clerk, but the person farthest up the command chain who knew what was going on. Military officers should be disciplined as well. They should have known better. The contract with Trijicon should be terminated immediately, and they should receive no further contracts until they — at their expense — replace all rifle sights with identical equipment minus Bible references. Policy must be enacted — and published — which clarifies that we do not mix religion and military action. There will be people — mostly right-leaning Christians — who will object that this isn’t a big deal. To them, I would ask this: would you mind if the US Army were using rifles with verses from the Koran which called for Christians to convert to Islam? You see my point. The Pentagon is full of evangelical conservative Christians. That’s fine, but their religious preferences must not spill into policy decisions or onto military equipment. If you are bored tomorrow, give Trijicon (“Brilliant Aiming Solutions”) a call. And by all means email or call your US Senator or Representative. Ask for hearings and action. Tip of the helmet to Boing Boing. I am astounded and agree with your essay. Thank you for sharing. I will be contacting my elected officials tomorrow. We have seperation of church and state specified for a reason–though it is often not adhered to–and we as individuals and as a nation must adhere to this or we might have ‘our’ light to the world extinguished. How can this have happened?! How can anyone consider this ‘OK? !’ Unbelievable. Mid-ages…DARK AGES. It is possible that the procurement officer wasn’t aware of the addition (i.e., the company put it on without revealing it much like the company probably put their name and model number on the sight) but the documentation for the purchase (including letters exchanged prior to the order) should indicate one way or another. Even those initially examining the sight might not twig to it being a Bible verse unless they were very familiar with 2Cor4:6 or similar as references to Bible verses (e.g., a devout Christian). Once twigged it is fairly obvious though. As a “right-leaning Christian”, I am disgusted with your comments. So, we don’t value life and only left-leaning Christians do? And this is coming from a priest? Is there some politicking here? Again, disgusted. No facts about who might find this acceptable other than the company in your post. None. Yet, with no facts, you paint your fellow Christians as war mongers and comfortable killing in Jesus’ name. Don’t look behind you, that’s Jesus measuring you for a millstone. And, speaking with my “American citizen hat”, there is no separation of church and state. I would think even left-leaning Christians know this. I suppose not. However, over here with the “right-leaning Christians”, we know that the US Constitution forbids a religious test for those seeking office or creation of a nationally sanctioned church. None of this is the same as one company selling one item for a part of the military. Next time, I would recommend, staying on point and not whitewashing your fellow Christians without actually asking them. For the record, I don’t think this is a good idea. But, it’s for the military to require the vendor make a change, not politicians. Great post which I have quoted and included in my own blog today. Way to go, Rev! This Christian woman and American citizens thinks you’re right on all counts. I don’t which disgusts me more, perverting the Gospel to kill people or violating the Constitution by supporting one religion over others. Erp, I don’t want an innocent person to lose a job. But I find it is almost impossible that folks in the procurement chain weren’t aware of this. Emilio, sorry to disgust you. First, this problematic behavior was done by right-leaning Christians. Second, as I suspected, nearly everyone here or elsewhere on the internet who has vociferously defended this practice is a right-leaning Christian. I said nothing further about these folks; the words about valuing life are yours, not mine. I think — as do legally trained minds — that there are, in fact, constitutional issues in play here. That said, I am not a lawyer, obviously. One important point on which you differ from both my opinion on the US Constitution: it is, in fact, politicians who should properly set military policy. That is exactly why the Constitution calls for a civilian commander-in-chief. If you want see an all-military regime, North Korea is probably a decent option; there are others. Not only does the Constitution call for a civilian commander-in-chief, it gives the Congress the power of the purse to oversee what actions the military-as-extension-of-Executive does and does not do. DoD contracts mean nothing without a line in the budget (or a supplemental spending bill of billions of dollars that aren’t part of the budget). It was part of the serial number and seems to have been standard practice for the company. I doubt they would have mentioned it to the procurement officer unless they were fairly sure he would enthusiastically approve (after all he might be Jewish or one of those liberal Christians or even an atheist or Muslim). Now if the procurement officer attended church with them or exchanged email about their common religion then start wondering (but at that point I would worry less about the Bible verses and more whether the procurement officer was steering business to fellow believers). Excellent post. It all sounds very civilised of course until we put the boot on the other foot! Congratulations on having the courage to speak out. What if the company actually has been inscribing the bible verse references all along as claimed? What if it was one mans way of witnessing to anyone who would handle one of their scopes? What if in the midst of the battlefield, a soldier was comforted or led to salvation by a single scripture reference? Maybe the man who had this idea was truly concerned about the one who read those words and not concerned about the purpose the weapon would serve or killing others and flaunting scripture? I don’t believe either that we should fight a war and cover our weapons in bible verses but things aren’t always as they appear at first glance, especially when it hits headline news. You are calling upon yourselves to know another mans heart when only God truly knows these things. I honestly don’t think the company’s intentions or our armed forces intentions were to kill on the battlefield all the while claiming it to be funny or in the name of God because of that verse reference.